So I was really craving one of those spectacular Asian style omelets with mussels or crab, but alas there was a dearth of seafood in the fridge. However, there were some quick cook egg noodles which in turn brought to mind leftover spaghetti frittatas (delicious), and then there was some fish sauce vinaigrette already on hand so this recipe sprang up. Pretty tasty and the fresh herbs on top add a nice refreshing touch. Cook egg noodles according to directions. Drain. Put in large bowl. In small frying pan heat all but 1 tablespoon vegetable oil. Add 1 shallot and fry until crisp. Drain on paper towel. Heat remaining tablespoon vegetable oil in 10″ nonstick frying pan over medium high heat. Add remaining shallot, garlic, mushrooms, chilies, and stems of bok choy. When mushrooms and bok choy have softened, about 7 minutes, add greens of bok choy. Cook 2 more minutes. Add to egg noodles. Beat eggs and add to noodles and vegetables. Add soy sauce. Mix well. Wipe frying pan clean and place back over medium heat. Add egg mixture and cook until lightly browned on bottom, about 5 minutes. Place under broiler until browned on top, about 3 minutes. Invert onto large plate. Combine bean sprouts, ginger, and fish sauce viniagrette. 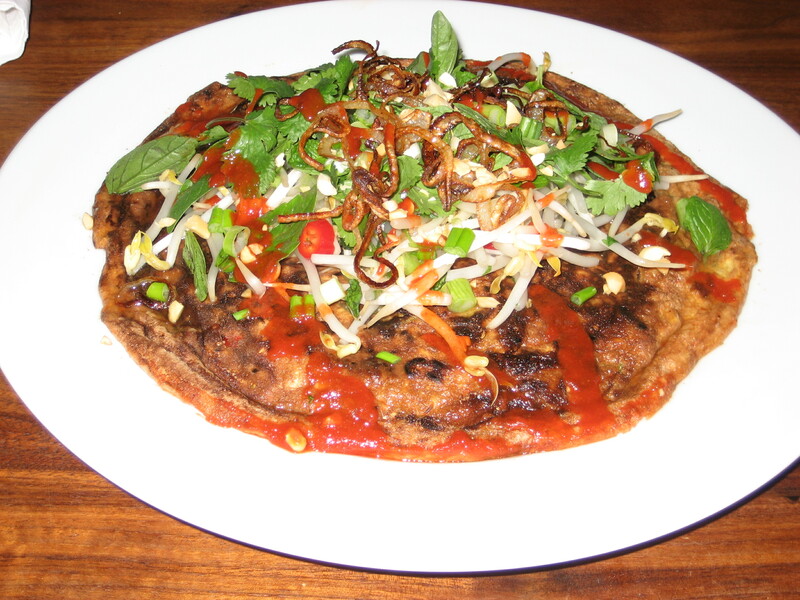 Top frittata with bean sprouts, mint, basil, cilantro, green onions, fried shallots, peanuts and hot sauce and serve.